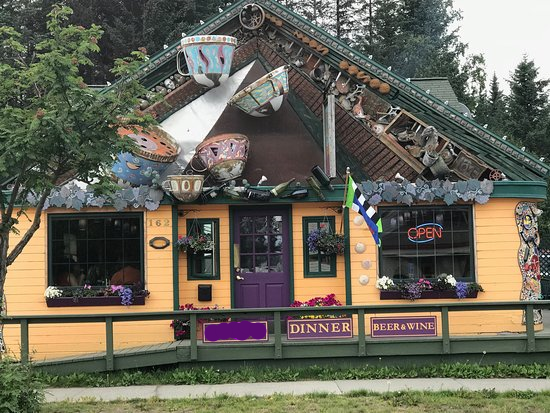 Café Cups is Homer, Alaska's downtown casual, fine dining destination. This cozy dinner house offers an intimate setting for a fresh and delicious meal. We specialize in healthy portions and great, friendly service. The dinner selections are fresh local seafood, mouthwatering steaks, pasta's and more. Finish the evening off with our decadent house-made desserts. Everything we do is made from scratch using (as much as possible) fresh, local ingredients from a variety of farms in Alaska, so our menu is always changing. Even the beverage menu includes craft beer and wine from local producers here in Homer. Our eclectic, inviting atmosphere, incredible food and friendly staff make Cafe Cups the perfect dinner destination. Our menu is created by Pavel Mikhail and executed by Pavel Mikhail and Guisseppi Riccardi, with desserts by Jessica Mikhail. We invite you to join us and experience the best Homer has to offer.